The 2012 Chevrolet Corvette Z06 is one of the lightest sports cars that provide a heavenly driving experience. The redesigned aluminum body structure and abundant use of carbon fiber material helps to keep the weight down to 1451 kilograms. 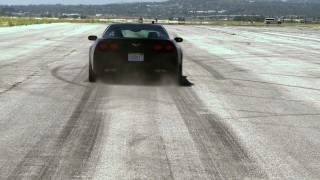 Chevrolet has smartly incorporated use of various advanced technologies to make sure that the 2012 Corvette offers the highest quality performance on all tracks. Under the hood, the Z06 is equipped with a 7.0-liter LS7 small block V8 engine that is capable of generating a whopping 505 Horsepower. The world-class LS7 engine is assembled by hand at General Motors plant in Wixom. The LS7 unit also features titanium connecting rods & intake valves, advanced dry-sump oiling system, racing style high-flow cylinder heads and a forged crankshaft which greatly enhance the performance. 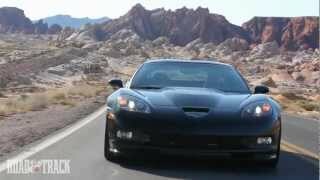 The 2012 Corvette is also one of the quietest sports cars you as the vacuum-actuated outlet valves greatly reduce the exhaust noise without compromising on performance. The fuel emissions of the engine are also quite lower than other cars in the segment as the exhaust system includes close-coupled catalytic converters. The transmission of power to the wheels is handled by a six-speed manual gearbox which might be an inconvenience to some drivers who prefer automatic transmission. The powerful Corvette Z06 can attain a top speed of 198 miles per hour and takes only 3.5 seconds to accelerate from 0 to 60 miles per hour. Sports car fans will be pleased to know that Chevrolet has equipped the latest edition of Corvette with world class Michelin Pilot Sport Cup Zero Pressure tires that when utilized with the 2012 PTM technology greatly improves the handling and offers maximum torque delivery. The result of such a combination is that the Z06 gains 8 % in lateral acceleration and the braking distance is also improved. The worhty contenders for Corvette Z06 are rival cars like Jaguar XK and Nissan GT-R when it is released. The Corvette Z06 is a dual-purpose sports car equally adept at daily driving or weekend excursions on the track. Its racing-inspired powertrain and suspension features, along with an aluminum frame and carbon fibre fenders and floor panels, contribute to a curb weight of only 3,199 pounds (1,451 kg), making it the lightest, best-balanced Corvette model and one of the most svelte supercars on the market. Z06 capability is enhanced for 2012, with upgrades and new features for the available Z07 performance package, highlighted by new Michelin® Pilot® Sport Cup Zero Pressure tires. When combined with new-for-2012 Performance Traction Management (PTM) technology – which manages torque delivery for maximum performance – the tires are expected to help set new benchmarks for Corvette performance. Engineers estimate an 8-per cent gain in maximum lateral acceleration, to more than 1.1g, and improved braking distance. The enhanced Z07 package’s effectiveness was demonstrated with a new lap time of 7:22.7 around Germany’s legendary Nürburgring, making it one of the fastest production cars to circle the famous track. Corvette Z06 also celebrates Chevrolet’s performance heritage with the 2012 Chevrolet Centennial Edition Corvette, which features a sleek black colour scheme, unique design elements and Corvette’s sports car technology. The special package is inspired by Chevrolet’s racing-bred foundation and is offered on all Corvette models for 2012. Corvette Z06 for 2012 includes interior improvements shared with all Corvette models, including new seats, a new steering wheel design and a new Bose Premium audio system. Customers who opt for the Corvette Engine Build Experience can participate in the assembly of their engine at the General Motors Performance Build Centre in Wixom, Mich.
Fixed-roof body style optimizes body rigidity and mass; offered in three trim levels – 1LZ, 2LZ and 3LZ. Wide front fascia with a large, forward-facing grille opening, a splitter along the bottom and wheel opening extensions along the sides to provide aerodynamic downforce. Cold-air scoop in front of the hood that integrates an air inlet system for the engine. Wide carbon fibre front fenders and carbon fibre floor panels. Available carbon fibre package, with carbon fibre roof, rocker extensions, front splitter and ZR1-style rear spoiler. Wide rear fenders with flares cover the massive rear tires and a brake cooling scoop in front of the wheels visually balances the fender extractor. Tall rear spoiler houses the CHMSL on the top of the rear fascia. Ten-spoke spider-design wheels (18-inch front; 19-inch rear). Four large stainless steel exhaust outlets. Z06 badging on the carbon-fibre front fenders. Two new exterior colours for 2012: Carlisle Blue Metallic and Carbon Flash Metallic (Chevrolet Centennial edition only). Also offered are Arctic White, Blade Silver Metallic, Inferno Orange Metallic, Velocity Yellow Tintcoat, Torch Red, Supersonic Blue Metallic. Cyber Gray and Crystal Red. New customer-selectable brake calliper colours offered in yellow, silver and grey. Red callipers are standard. Offered exclusively in Carbon Flash Metallic with satin-black graphics. Special badges that signify Chevrolet’s racing history, including a graphic logo featuring an image of Louis Chevrolet on the B-pillars, the wheel centre caps and the centre of the steering wheel. The historic Corvette crossed flags badge contains a small adaptation, with “100” in place of the traditional fleur-de-lis symbol in black, only for the Centennial Edition. Unique Centennial Satin Black wheels with red stripe, sized specifically to the respective Corvette models, including 19-inch/20-inch for Z06. Magnetic Selective Ride Control is standard. Ebony leather-wrapped instrument panel and doors complemented by red stitching, also on the steering wheel, seats, console and shifter. The seats feature microfibre suede accents on seats, steering wheel, shifter and armrests, which were first used on the 2011 Z06 Carbon Limited Edition. Corvette’s interior is inspired by the car’s dual-cockpit heritage. Microfibre seat inserts are included with the leather-wrapped interior (3LZ). New steering wheel with model-specific badges, streamlined switch trim and wrapped spokes. New, optional Bose Premium audio system includes nine speakers (vs. seven in 2011), including new tweeters located in the instrument panel and improve Bose Nd next-generation bass performance. Steering-wheel mounted audio controls are on all models. SiriusXM Satellite Radio with a one-year subscription is included with the Bose audio system. An onboard navigation system with voice recognition is included with 2LZ and 3LZ models. It is a DVD-based system that uses a 6.5-inch (165 mm) colour touch-screen display. Head-up display is available on 2LZ and 3LZ models and includes Track Mode with g-metre. Gauge cluster displays the Z06 logo on a 7,000-rpm tachometer and includes a readout on the oil pressure instrument to reflect the higher standard pressure of the Z06’s dry-sump oiling system. A custom leather-wrapped interior package is standard on the 3LZ trim, featuring a leather-wrapped upper and lower instrument panel, door pads and seats; choice of exclusive colours: Dark Titanium, Ebony or Cashmere, with unique colour breakup; padded door panel armrests; “Corvette” embroidered on passenger-side dash pad and a unique centre trim plate with a gunmetal pattern. LS7 7.0L (427 cubic inches) engine rated at 505 horsepower (377 kW). Racing-derived high-flow cylinder heads with lightweight titanium intake valves. Racing-style dry-sump oiling system that ensures adequate oil pressure during high-load cornering. The LS7 is hand-assembled at GM’s Performance Build Centre in Wixom, Mich., and incorporates special processes typically seen in racing engines to produce a highly refined and precise product. Lightweight, four-into-one exhaust headers discharge into close-coupled catalytic converters. Two-mode mufflers that feature a vacuum-actuated outlet valves, which control exhaust noise during low-load operation but open for maximum power. Six-speed manual transmission – automatic not available – that is strengthened for the LS7’s torque and incorporates a pump that sends transmission fluid to the front radiator for cooling. Upon its return, the fluid removes additional heat from the differential lube before returning to the transmission. A single-mass flywheel and lightweight, high-capacity clutch channel torque to the rear transaxle. Limited-slip differential, with enlarged ring and pinion gears. Stronger axle half-shafts with stronger universal joints transmit power to the rear wheels. 0-60 performance of 3.7 seconds in first gear, quarter-mile times of 11.7 seconds at 125 mph and a top speed of 198 mph. An aluminum body structure for optimum stiffness and light weight for the fixed-roof body style. Perimeter rails are one-piece hydroformed aluminum members featuring cast suspension nodes, which replace many welded steel components on other Corvette models. Advanced structural composites featuring carbon fibre are bonded to the aluminum structure. The wider front wheelhouses, for example, are carbon composites, and the passenger compartment floors combine carbon-fibre skins with an ultra-lightweight balsa wood core. A magnesium cradle that serves as the attachment point for the engine and some front suspension components. It is lighter than aluminum, yet incredibly strong, and helps improve the front-to-rear weight distribution, as do carbon-fibre front fenders and wheelhouses. Battery relocated from underhood to a position in the rear cargo area, behind one of the rear wheels. Z06-specific wheels, tires and brakes, as well as rear spring and roll stabilizer. Large 18 x 9.5-inch cast-spun aluminum wheels and 275/35ZR18 tires in the front, and 19 x 12-inch cast-spun aluminum wheels with 325/30ZR19 tires in the rear. Goodyear F1 Supercar Gen 2 tires are standard. Four-wheel disc brake system, consisting of 14-inch (355 mm) vented and cross-drilled front rotors and 13.4-inch (340 mm) vented and cross-drilled rear rotors. Red-painted six-piston front callipers that use six individual brake pads. Individual brake pads are used because they deliver more equalized wear compared to what would otherwise be a pair of very long single-piece pads. Rear brakes use four-piston callipers with four individual brake pads. A four-channel ABS system is standard, as is a very competent Active Handling system – complete with a Competitive Driving mode. New Michelin® Pilot® Sport Cup Zero Pressure tires, developed by the same Michelin engineers who develop tires for Corvette Racing in the American Le Mans Series. They are essentially street-legal versions of a racing tire. The 285/30-19 (front) and 335/25-20 (rear) tires are matched with all-new aluminum Cup-style wheels in satin black or machined finishes. They are about five pounds lighter (2.2 kg) and stronger than the ZR1 20-spoke wheel offered in 2011. A new, full-width racing style spoiler for improved aerodynamics. Four standard air bags include side-impact air bags, which provide head protection for outboard passengers in the event of a side-impact or rollover crash. Active Handling electronic stability control system helps reduce the risk of rollover crashes by keeping the vehicle in the driver’s intended path by applying throttle, braking or a combination of both. Pretensioners minimize forward movement during a collision, and are standard on the front safety belts. Load-limiting retractors cinch the belt more tightly. Standard remote keyless access with push-button starting. Corvette Z06 is offered with OnStar as standard on all models. It uses GPS and cellular phone technology to automatically call for help in the event of crash. OnStar subscribers also can use the service to be Good Samaritans by sending help to other motorists, and to call for help in other non-crash emergencies. Six months of complimentary OnStar Directions and Connections service with Turn-by-Turn Navigation for easier route guidance on all Corvette models. The feature is easy to use because all directions are sent to the car by an advisor, without the need to stop. Stolen Vehicle Assistance helps police track the vehicle in the event of a theft.